The name Weber is the most respected brands in the manufacture of BBQ and related accessories. They are most sought-after brand not only USA, but also all across the world. Their reputation lies in the fact that their products are all of high quality and durability. Their customer service and support is also outstanding even in this high competitive market. Weber products are not cheap but it is justified by the fact that their product stands the test of time. The Q series of Weber is an electric grill and has a modern and appealing look. As many restrictions were introduced banning the use of any type of fire in apartments, sale of Weber’s electric grills increased. The Weber Q 2400 is portable and has a lot of cooking space. As it is a portable grill, it is very much ideal for even outdoor cooking. 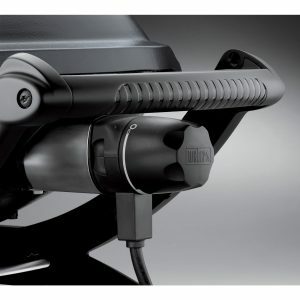 For those who have already used the previous version Weber Q 240 know that Weber Q 2400 is a remodeled version of Q 240. Certain features like the control nobs, newly designed large handles and side handles, and a sturdy body are the new changes to the Weber Q2400. There is one unique feature only a few electric grills in the market offer and that is the facility to sear meat by sealing the juices. This feature is usually given only in traditional type of grills but with Weber Q 2400, this is possible. Weber Q 2400 is the restyled model of Q 240. The features of the electric grill are in such a way that it satisfies it brand expectations and goes beyond giving the user the utmost satisfaction in terms of flavour and also in performance. Its space saving and portability makes it even more desirable. What’s in the box? Cast Iron Cooking grate, Cast Aluminium bowl and lid, Variable temperature control, Side Handles for carrying, Disposable drip pan and Grease Catch Pan. Let us look into some of its best features in detail. Assembly: No one needs to worry about the assembly of the Weber Q 2400. It comes to the buyer as a fully assembled piece. It is compact and looks great for places like apartments and condos. 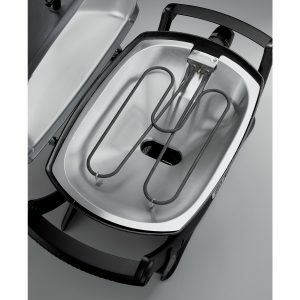 When placed with the Weber Grill cart, this is the most lovable appliance for any food lover. Durability: Every dollar spent should have a value for it. Hence, buying a material of superior quality is very important. No one wants to invest money on a product only to change after a couple of years. The brand name of the product itself says how durable it is. The body and lid of the appliance is made of heavy cast aluminium with glass-reinforced nylon frame. The grates are cast-iron enamelled with porcelain to give not only a longer life but also provide better heat retention and heat distribution. Portability:The Weber Q 2400 is light weight and portable. If you have the Weber Grill Cart, it is even better. The size of the grill is very compact that the user can carry it anywhere, even to the camping sites. Heat Retention and Control: The heat retention and control of this grill is beyond comparison. This is made possible by two factors – one is the aluminium heat retention liner and the other is the grate which is cast iron enamelled with porcelain. Grilling needs consistency and even distribution of heat. Without these factors, food becomes partially overcooked and partially undercooked. The above features in the Weber Q2400 incorporates all the essential elements for a tasty cooking. Controlling the heat of the appliance is also an important factor to cook a great food. It is a 1560 watt/ 120-volt grill with one know that is so easy to use. The variable temperature control gives options based on the type of food being cooked. It is also rather simple thus, eliminating complexity both in design and usage. The simplicity of the design in having a rheostat to control the heating element instead of circuit board makes the durability of the temperature control far better than other brands. Cooking Area:The cooking area in the grill is generous. When the word ‘generous’ is used, it does not necessarily mean that it should be huge. But the cooking area is huge enough to cook for four people in a family. If the cooking area is huge, it can never be compact and this appliance has been designed keeping in mind, the word ‘compact’. The cooking area is 280 inches. Its height is a comfortable 26 inches, width of 31.5 inches and depth of 25.1 inches. Compact Size:By just having a look at it, one can tell how compact it is. Portability and the compact size goes hand in hand. When the grill is so compact, it is so easy to carry it anywhere and thus, it is more portable. Take the grill anywhere you go, to the beach, for camp fires, or even for a vacation. It is certainly not going to take too much of the space. 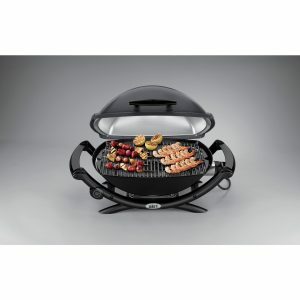 The Weber Q2400 is the most suitable electric grillif one is living in an urban place. 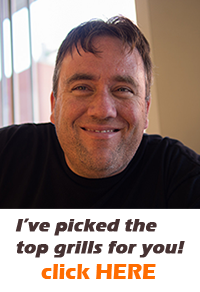 For people who cannot afford a big griller in their balcony or porch area, this is the best. But being compact doesn’t mean the user has to compromise on the taste of the food. Any kind of food – hot dogs, lamb chops, burgers and even veggies can be cooked to perfection with minimal smoke and debris. Easy to Use: The design has been deliberately kept simple. At the snap of the finger, this device can be used. It is so simple to use that whoever buys this device would never ever go out to buy food. It is simple to use, simple to clean and simple to handle. It is not elaborate in the functionality. This is a product recommended for those who want a simple product with high quality. Easy to Clean: The Weber Q 2400 grill is very easy to clean due to the fact that it is made of superior materials and a good finishing. Just making use of a nylon brush pads is enough to clean the grill after use. Though the grill is square, its corners are rounded and that makes a huge difference in cleaning. The best part is that the parts can be removed for cleaning. The aluminium liners can be taken out separately for cleaning and the drip pan is easy to change out. Warranty: Warranty for a period of five years is given to the aluminium castings, lid assembly and stainless steel burners. Even the paint has been given two years’ warranty excluding the fading and discoloration. The porcelain enamel cast iron cooking grates and the plastic components are warranted for 5 years whereas the remaining parts of the appliance is warranted for a period of two years. The Weber Q2400 is a perfect electric grill and satisfies all the requirements of the user. One cannot find any fault in this grill but there are a few points that could add more value to the grill, even if not now at least in the future. The presence of built-in thermometer would have been more convenient, especially in the case of electric grills. It is better to buy a digital thermometer to check the temperature of food being cooked. Adding more length to the power cord would have been better. According to the company, extension cords should not be used as it would give rise to electrical fires. With only 6 feet of power cord, it is a bit of inconvenience. The grill is compact. No questions but it is better to use it outdoors. The company doesn’t recommend to use this product indoors as it will cause more smoke inside. The cost of the grill is slightly higher than the other brands. But it is also worth the money due to its durability. It is up to the person who buy it to judge it by cost / quality. Sometimes, compared to the gas grills, cooking in low temperature is not so great. The food doesn’t turn out as crisp as it is desired to be. But even that is based on experience of using the grill. With proper usage of the grill, the possibility of getting the result as a gas grill is more. The biggest advantage over all the competitors in the Electric Grill market is the Quality of the grill. It is quite unbeatable. Weber Q 2400 is compared to the Rolls Royce in the electric Grill market. The craftsmanship in this grill is adorable. All parts of the grill are of superior quality. If this grill is bought, then one can expect this to last for years unlike the cheap ones in the market. For a BBQ, fire is needed. But this electric grill has nothing short to offer. The taste of the food is amazing if cooked in this grill. It gives a pleasant grilling experience and is nothing short of the conventional grills in any aspect. Simple and elegant design with good temperature retention makes this the best in market. There is no inconsistency in cooking the food. Any type of food can be cooked in this and there is no hassle and worry about hotspots, charcoal or gas. If you want the smoky flavour, no issues. Just use some wooden chips on the grater and the smell of the wood will transfer to the food. Cooking above 300 degrees is possible. The food will have good grill mark and a nice brown colour. The taste is incredible. It is big enough to feed a family of four. Though not big enough for a big party, it can simple cook anything – a hotdog, burger, fish or even veggies. Its’ design is compact. So, the best choice for people living in a condo or an apartment is Weber Q 2400. The best part about the Weber Q2400 is the simplicity in cleaning. No other grills have such easy to clean facility. After the grill has cooled down, the grilling grate and grill can be just wiped with wet paper towels. Soapy water is enough. There is no need for strong chemicals. If a real cleaning is required, then the grill can be removed, soaked overnight in soap water and then cleaned. When it comes to the drip pan, most of the competitors fail. The Dripping containers are disposable and can last the whole season. The flow of drippings to the containers is also so efficient. This electric grill might cost a bit high but when compared to the money spent on charcoal and gas, electricity is minimal. One can save a lot by paying the right amount initially. No other brand lasts longer than Weber. Is Weber Q 2400 a value for money? Certainly, Yes. The features and advantages that the appliance has, makes it the most desirable Electric grill. The grill heats up so quickly, its size is so compact and the quality is unbeatable. This electric grill is suitable for anyone who loves grilled food. With the increase in number of apartments, condos and many other places where traditional grills are not allowed, people are resorting to new ways to make BBQ and enjoy their favourite kind of food. Since the use of gas and charcoal operate grills is banned in high rise buildings, the best option is to use electric grills. For those who live in such kind of places and really want a taste of fresh grilled food, Weber Q 2400 is the best choice. Also, in rural places, where the availability of propane is scarce, Weber Q2400 would be the best alternative. It gives the taste same as the one provided by traditional grills and there is no compromise in quality. There is no reason not to recommend the Weber Q2400. It is the best choice which gives 100% satisfaction. It is sure to make the art of cooking more joyful and is there to last longer, be it in your balcony or porch!